Go on a relaxing adventure with the Sun Driver T 580 Cross Over. The camper has a two single beds and an electric lift bed. The seating area can also be converted into a single bed. The camper therefore offers sleeping space for 5 people. 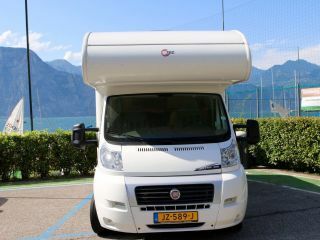 Still, the camper is very compact because it is only 7.39 meters long. The rotating front seats allow you to create an atmospheric dinette with 5 seats. The kitchen is also fully equipped. There is a spacious refrigerator (142 liters) with freezer. There is also a Truma combi boiler in the camper. So you can use hot water in the camper and turn on the heating on the cold days. The bathroom has a sink, shower and toilet. In the bathroom, the shower and toilet room can also be separated by a sliding wall. The garage also offers sufficient storage space for all the things you want to take with you on holiday. The camper is constructed in such a way that it is well protected against hail damage. In addition, the safety of the ABS, driver's airbag and EBD has been considered. ESP + ASR, "Hill-discent + Hill Holder", "Four-Season" tires, Electric door mirrors, height-adjustable "Captain Seats" with arm rests, preparation Radio with speaker, fog lights, wheel covers, heated recovery tank, screen door, cup holders, USB connection, etc. There is also an option to rent a folding bike e-bike with 6 gears for only € 9.50 per day! The rental period runs from Saturday morning 10 am to Friday afternoon 5 pm. Beautiful Adria Sun Living vending machine with 2x 2 person fixed beds. 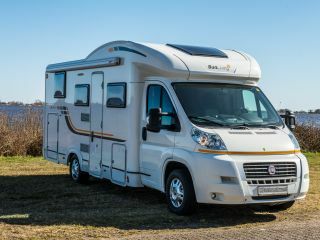 Nice complete family motorhome rental!